Physical Description Damien is short, narrow framed but solid and very fit. His skinny symmetrical build uncovers a well-defined musculature, hiding untapped power beneath. Damien is known for his calmness, his movements are slow, calculated and very deliberate, giving an ever-present air of nonchalance, that is only doubled by his easy going manner. His lips are almost always painted with smug smirk and a person is never sure what he is thinking. A stark contrast to his calm manner is his hair, which is in a perpetual state of wilful disarray. On top of that he has never been know to be clean shaved, there is always some sort of stubble on his face. Clothes he wears are practical for engineering work, nicely tailored, neat but always scruffy on the edges and erring on the side of slovenly. Because of the racing accident he lost his right arm, which is replaced by a bionic arm of Fernegi make. The arm is covered with artificial skin, making it almost impossible to distinguish from a real one. He has greater strength in that arm, but the arm is acting up every so often and requiring retuning. Distinguishing Marks or Features Saying Damien is a ruggedly handsome rogue is a first and last impression one gets from meeting him. General Overview Living with different crews, species, subcultures on many posts over the years has made Damien a very observant and openminded person. He is seen as cool, one could easily say aloof. Not being tied to protocols his mindset is very practical, and the colourful experiences make him almost ready for anything - a problem solver. His manner is unpretentious at best. As a kid Damien developed a rebellious streak towards the way his father and family employed their vast resources of the trading consortium. Living in opulence having little regard for the “commoners” as his father like to call everyone else, that streak later grew into idealistic compassion for the downtrodden and those on the bottom of the social ladder. He was often scurrying funds or supplies from the company for different charities. Tough fathers love made Damien resent all authoritative figures in his live, making him quite uncooperative if pressed. His brother death and subsequent expulsion from the family and the company, changed Damien. His outlook on the world became grim and resentful. The blame heavy on his shoulders. He became a drifter, his skill and knowledge in engineering systems and other less savoury mechanical talents the only means to get by. He changed his last name to Walker, erased his digital past as not to be a target of his fathers competitors. Damien lives for the here and now, with little regard for the future. With years he learned to find a semblance of peace within, opting for the scoundrel way of life seeking adventures where he could. He has a cynical streak and little care for his career, he does what he feels is right, the moral compass always in the greyish area. Damien learned to hate the injustices that the great and big trading, industrial and most of the time criminal corporations or syndicates are doing on the frontier, where much is allowed. If he has a chance he tries to mitigate the negative effect, helping those in need even if at odds with the law. Strengths & Weaknesses Damien worked for years as some sort of mechanic on different types of ships and stations, which has made him an extremely adaptable and knowledgeable out of the box thinker. Being a focused self-taught mechanic with a reputation for improvisation and saving more than one trade run has built him a solid reputation as some sort of savant engineer in the quadrant. His penchant for adventure and excitement however has landed him on jobs that were way of the well-trodden legal paths, giving him a rouge status among the crews and captains, but none were quite sure what that entitled. Nothing was proven or tied to Damien, which was another point of contention among ships that were running a clean business when hiring him. Damien likes to solve problems on his own to the great annoyance of captains, making him a hard person to follow in any team, the reason why he always felt more accustomed to smaller crews that ran like families and everyone trusted each other to do their jobs without all the hierarchic verbal red tape. It is also the reason why he felt out of place on bigger lacklustre trading ships of the quadrant, usually leaving them on his own. If there is a job to be done you do it, you don’t ask for permission. 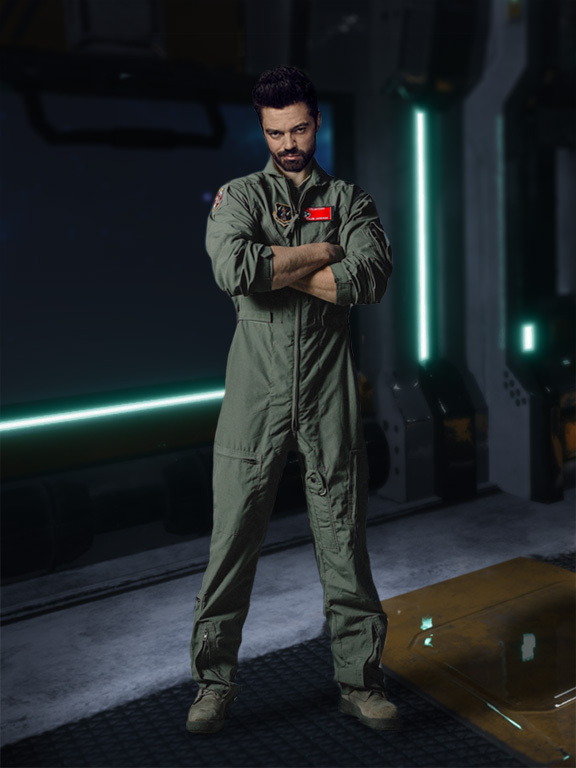 Living on ships and stations doing all sorts of jobs through the quadrant and not being picky who to work with (as long as they pay and there is some excitement involved) has made Damien a well-connected person giving him the knowledge of the inner working of the business. On the other hand, it has also made him touch the other side of the legal spectrum and those contacts never forget about you. So, Damien takes every opportunity to listen carefully at the grapevine so as not to leave an opportunity go by. His biggest weakness is his ability to say or do the wrong thing at the exactly wrong time, his idealistic nature getting the best of him, when faced with injustices. And second to that is his fondness to drink, that only multiplies his above mention ability. Damien has no sense for business or saving credits, the lack of any real ambition and ever-present felling of loneliness, makes Damien a big spender on the down time and quite a magnet for the ladies – the latinum catchers. His devil may care attitude coupled with his slight self-destructiveness does not give him a real drive to survive making him a lose canon at times. The reason why captains avoided taking him on trade deals. Ambitions Damien is still haunted by the death of his brother, the blame he puts on himself overrunning his want for any true ambition, except to live in obscurity and take what he can from the rich to give those in need. Although he has abandoned though on the event, he is still searching for ways that would explain the accident he was responsible for. Passions Damien is not a man of many passions. You will not see him take up a hobby. He is satisfied if he has a big workload, something to occupy his mind. In his free time he can be seen tinkering with ship designs. Since his engineering talents were used in heists he has developed a certain pleasure or affinity for cracking safes. Personal History Damien Darth was the fourth and youngest child of the trading oligarch Harris Darth of the Darth Corp. His older brothers Augustus, Justin and sister Mira-belle being their parents focus point for the continuation and prosperity of the great Darth trading empire. From early age on, they were groomed and prepared for the roles they were to take within the company. His father a relentless and hard driving force, filled with ambition for his offspring, gave them an upbringing devoid of love but filled with the desire to gain his approval. Damiens mother Lenora, was the only beacon of light, giving the children the much-needed love and attention. The Darth family was vast and old, they began making fortune along the borders of know space when there was no federation yet, always living on the borderlands moving their business when the federation grew. They began as modest traders, but soon grew into mining and industrialization. At the present their holdings were so extensive and wide spread that nobody was sure where their fingers lay anymore. Their influence spread among the settled worlds. Their trading practices adapted to their surroundings. Damiens father the only person who, knew exactly what all that entitled, holding the reins of company tightly in his hands. The main holdings or the HQ of the family is located in the Fallara system, which is practically owned by the corporation. The systems asteroid fields are rich in mineral deposit, gas giants mined for their gasess and the main planet Fallara V, a Y-class designation the so called Demon world, was rich in dillithium. This is where his family made fortune many generations back, opting to live on a class L arctic moon orbiting the planet. They have built a series of skydomes simulating earth conditions, the largest of them holding Euthoria the family’s main building, a modern recreation of a French château. Damiens childhood was spent pursing many interests that were beneficial to the family, he was always surrounded or pushed by one or the other tutor on a wide range of subjects. His father was taking all his children along on his trade deals, pushing them to learn and observe something, that was beyond Damiens comprehension at such young age. Even thou Damien had no interest in the boring and longwinded trade discussion, he loved meeting new cultures and learning about them. Even as a small child he was always sneaking out, to explore and have imaginary adventures, much to the annoyance of his many caretakers. Since he was the youngest his father was bit more lenient towards him, than the other children, which gave Damien room to grow his imagination. It was on one such trip, when Damien was nothing but 8 and he felt especially mischievous, that his mother took him out on a trip. The trade discussion where a bit different that time, as they were running behind closed doors and no children were present. His brothers were dutifully working with their tutors, but restless Damien and convinced his sister to play a prank on the visiting trade company. Their mother saw through their plan, laughed and simply decided to take them out, to calm their restless spirit. As they excited the docked trading ship and entered the main promenade, a big explosion shook near the pressure doors, trapping Damien and Mira on the inside of the station, but his mother, who was walking behind them was sucked into space. It was in that moment Damien watched her face being emptied of love and filled with stillness. Everything changed for Damien from then on, the death of Lenora falling heavy on his fathers soul. His routines became more paranoid, he blamed Damien for the event and pushed him even harder. He has removed them from Euthoria and life was spent on one or the other trade ship, always moving about. Most of the time they were aboard the SS Gauntlet, his fathers flag ship. It was here Damien developed love for the engineering, tutored by the ships Chief engineer, uncle Roman who gave him much needed love and attention. Their mothers death also changed the relations among the siblings. The oldest Justin, who was following his father in every step, resented Damien and took every opportunity to blame him. Damiens sister Mira, became detached not quite knowing where to stand among the fighting brothers. His other brother Justin was the only one, who had their mothers kindness and never found blame in Damien, he was the only sibling Damien could really connect to. The two often getting into one trouble or the other, mostly due to Damiens crazy plans. When they all grew into teens the broad strokes of their trauma and fathers upbringing became more pronounced, differently in each of them. Damien grew more and more restless, seeking pleasure in his fathers discomfort over his actions. It started with small things but with years those escapades grew into unruliness often putting him and his father at odds. The authoritarian figure that Harris was, Damien was often put into some sort of harsh disciplinary act, that only deepened their relationship. When Damien was 18, his older siblings were already becoming accomplished company members. Him being the only one that father did not quite know what to do with, slowly losing hope of integrating him into his plans. Justin who was then 26, was becoming more and more like his father, being the eldest and most ambitious, he was slowly becoming his right hand and blindly following father in his footsteps. Justins ambition and desire for fathers approval were often at odds with his siblings. The 20 year old August went another direction, he didn’t have the killing drive needed for trade, but he was becoming an excellent accountant, the numbers and computer systems being his forte. Mira, who was at time 24 was another story, she developed into an emotionless queen, using legality and undercut trading practices to undermine Darth Corporations opposition. It was very hard to reach her, Damien being the only one who could glean the tortured soul in her. It was in this era that Damien was exposed to underground space races Slingshots, Asteroid drift drives and the most dangerous Solar flare riding. His engineering skills and wild nature quickly adopted the sports, he began building his own racer ships and developing his piloting skills. He created a space racer identity Damien Walker to hide his heritage, but above else to hide from his father. As such, Walker quickly became a name among the racers. Thankfully, due to some sort of disciplinary act, he was assigned to a range of duties under one or the other captain in his father trading fleet. And in almost every system they landed, he could find contacts to do a race. As he was diving headlong into the criminal world, he learned that his father company was doing much more than simple trading and mining. It was involved in wide variety of illicit business like smuggling, exploitation of resources, illegal trades, weapon deals... It was all done very smartly through subsidiaries and proxies, but Damien had some knowledge of those and he quickly pieced the picture together. The Darth empire was not what it looked like and to an idealistic young man it was too much to hold inside. He knew he could not confront his father, but he could undermine him. So slowly he became interested in the deals, shadowing captains and watching, learning how they smuggle goods and where they go. The extent and intensity was mind-blowing, these were no small time smuggling runs, often the high levels of governments were involved, the reason why nobody could touch Harris Darth. In the next two years Damien would be siphoning funds, rearranging shipments, putting out tips all to expose his father. His quickly realized his efforts were in vain, so he opted to help where he could. Giving company money to charities, reassigning shipments as an relief effort to the areas that his father destroyed, once he even sabotaged a ship. Since security was top notch aboard the trade vessels, Damien evolved into an accomplished rouge. Leaving practically no traces, the fact that he was intimate with the company protocols only helped him. Unbeknownst to Damien, his racing circuit was loosely monitored and silently allowed by his father, who felt the young man needed a vent as he did not want to completely push him away. As long as his duties to the company were followed, Harris realized a confrontation on that matter would only grew them further apart. And Harris did not want to lose him, he silently hoped Damien would outgrow his childish notions of adventure and slowly begin integrating himself into the business. What he did not know were Damiens small stings in his operations. The year was 2375, Damien was just shy over 20, when a big race was announced, an Asteroid drift in the Tyrellis system on the edge of the Klingon border. Damien spent the last 6 months preparing his racer The Needle with every intention of wining. He knew his uncles ship was heading in that sector for trade runs, so he joined him alongside with his brother Augustus. The race was illegal, and all the big faces came, with all the illegal betting that ensued. Augustus was the only sibling that shared Damiens love for the sport, helping him where and when he could. On the run to the system they were both secretly preparing the ship for the race. But this time Damien made a mistake and betted on himslef, as he did not know the race was fixed. This was the big league after all and too much latinum involved. A day before the race, his fathers ship SS Gauntlet warped into space. Harris was intent to stop Damien doing the mistake as he full well knew what the deal was about. After a confrontation, Damien was confined in his quarters and put under surveillance. As the bet was made Harris went to the Ferengi ship, that organized the event, to use his influence and money to pay off the bet. But before he could fix his sons mistake, the race started, and The Needle was seen flying over the start line and wooshing with the best racers in the asteroid field. At that moment Harris knew he could not fix this one mistake for him, The Needle was in the race. He joined the watchers in the VIP lounge, pretending not to know who Damien Walker, the racer in The Needle was. He even had to place a bet himself and watched the sport on the big screen. With horror he eyed a Klingon racer skimming past The Needle and as he sent the little ship spinning into a nearby asteroid. The ship exploded taking the pilot within. As Harris returned to the ship, he found Damien crying in his quarters. It was Augustus who decided to save his brother and finish the race. Furious Harris dumped Damien with Fernegis and all the debt he has made on the race, disowning him from the family. That left Damien with his new last name… Walker. Any kind of debt in the Ferengi alliance is substantial, this time he was indebted to DaiMon Mok. Damien became a slave in everything but name. Due to his debt, he was forced to sign a contract for 10 years of servitude to repay his debt along with interests. As Mok was a circuit ringer for space racers, he saw the potential of profit in Damien, so he trained and ran Damien on countless races. Combining his mechanical skill and piloting skill Damien quickly became Moks prized racer. Heartbroken over his brother’s death, blaming himself and everyone around him, Damien descended into substance abuse and adrenalin seeking. With little regard for his life, devoid of any fear of death, his runs became infamous. Until year 2381, when he was driving heavily intoxicated in the Vulcanic canyons of Berilla VI, hitting the side of the mountain and crashing his ride. In that accident Damien lost his right arm which was replaced by a bionic one. But after the transplant his eye and hand coordination were not the same. He quickly felt out from the racing, becoming obsolete. Mok was annoyed he lost a great deal of profit, but knowing full well that Damien was still valuable, used his skills as an engineer to make better racer ships, to find new ways to mask his smuggling operations and to plan his heist. It was here that Damien became quite an accomplished safe breaker. After 10 years of servitude, his debt repaid, Damien was finally free. With no ambition, he placed himself on the market as a Mechanic for hire. Thankfully he had made a name for himself so getting berths was not hard, keeping them was harder. He was appreciated as an engineer on all posts. But he could not get along with all the captains. Damien was unruly so the captains that wanted to run a tight ship, rather passed him by. During the next 7 years he worked everywhere, ships, stations, docks. Always switching between posting to keep it interesting. During these years he met and got to know many people from different races and familiarised himself with most of the different ships systems. Occasionally he took an offered job, a heist, a safe break, a small smuggling operation. But always he donated the money to a local charity or... drank it. All that time he was still watching his fathers operations from a far. If could throw a wrench in some of his plans he did. But after the death of Augusts all that effort felt empty, so he found satisfaction in helping those in need. Sometimes he intentionally found a rich mark and stole from him, just to give his booty to the poor. Living in opulence in his formative years, and later disillusion by life… credits held no appeal to Damien. It was in the year of 2394 that he met A'Dana, a beautiful smuggler queen in one of the sectors along the border. Silently they became involved and for a short time Damien even felt love, but ultimately they knew they were both too damaged and in the wrong buisness to run any semblance of true romance. For a year he worked for her running her dock at the station, doing a job here and there. Until they were forced to part ways. So Damien left, finding his first berth after a long time, on a civilian freighter SS Fawkes.